James Dothard Dilts, who died yesterday at age 81 after a short illness, had many talents. 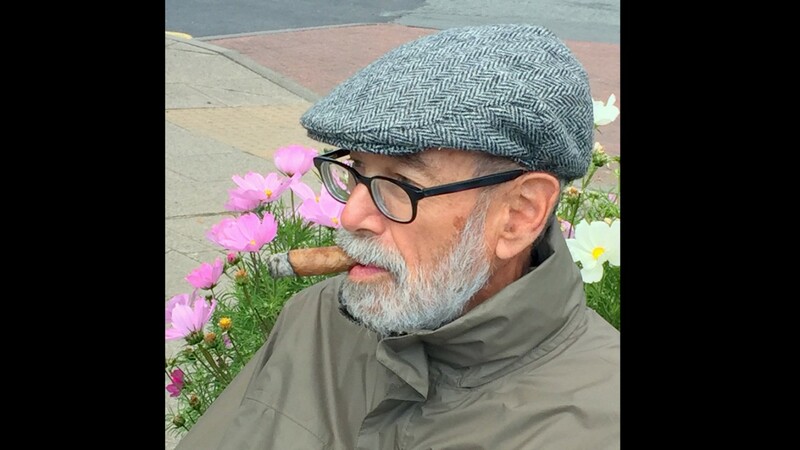 A journalist, historian, book author, carpenter and sailor, he was also a jazz connoisseur, documentary filmmaker, friend of artists and a leader of Baltimore’s preservation movement. His presence will be missed in those diverse spheres even as his legacy will grow thanks to what he’s left behind – not just a written record of hundreds of articles and a half dozen books, but an elegance of manner capped by an infectious grin that drew many into his orbit. Insofar as describing himself, Jim liked to recall the day he emerged from a dusty railroad tunnel in West Virginia (part of his hands-on research of the Baltimore & Ohio Railroad) only to be confronted by a bewildered local. “You some kind of enTHUsiast?” the man asked the hot and begrimed city slicker. Jim cherished that description and, as time went by, his enthusiasm for his adopted hometown only multiplied as he battled to preserve Fells Point from a highway and then foolish development, covered the local jazz scene for DownBeat and City Paper, and unearthed such buried treasures as Baby Lawrence, the legendary Baltimore tap dancer who had fallen on hard times. It’s not clear where, exactly, Jim was born in the Depression year of 1936 under a Scorpio sign. Some say it was Three Bridges, an unincorporated town along the Raritan River in New Jersey. I always thought it was Buffalo, where he lived for a spell. He also moved with his family to Providence, R.I., and elsewhere in Jersey. When his father, a traveling paper company salesman, suggested that he ought to see more of the world, Jim enlisted in the Navy. From there, on the GI bill, he graduated from Northwestern University with a thirst for literature and writing. After a failed effort to conform to an advertising job in Chicago, he came to Baltimore to try out his luck at Johns Hopkins University. His stint as a writer at the alumni magazine did not last long, but it gave him entrée to the Baltimore Sunday Sun, where he was hired as a feature writer. It was there that I met him in early 1969, trying to gain insight as the very green city editor at the Johns Hopkins student Newsletter. I later worked with Jim on The Sun and at the publication Railroad History. When I saw him last – just five days ago – we shared a few words about our half century of friendship. As he roamed through 1960s Baltimore, pen and notepad in hand, and settled into a waterfront loft on Thames Street in Fells Point, Jim found his subject matter. His weekly column, “The Changing City,” tackled urban redevelopment, mass transit, blockbusting, errant landlords and “the highway to nowhere” that was tearing up the social fabric of West Baltimore, Sharp-Leadenhall and parts of Canton. He covered housing, transportation and state politics for The Sun through the mid-70s, then embarked on a new career as the chronicler of the travails and triumphs of the B&O Railroad, upon whose shoulders so many Baltimore family fortunes and institutions rested. While undertaking this monumental history – which ended with 500 pages of original research that won accolades and awards – Dilts worked as a carpenter and handyman at the Maryland Institute of Art. His companions were a collection of fiercely independent artists led by sculptor John Ferguson. In 1981, the crew put together a memorable exhibit at the Maryland Institute titled “The Fine Art of Maintenance,” a play on Robert Pirsig’s counterculture manifesto, Zen and the Art of Motorcycle Maintenance. Jim’s contribution was a short film. 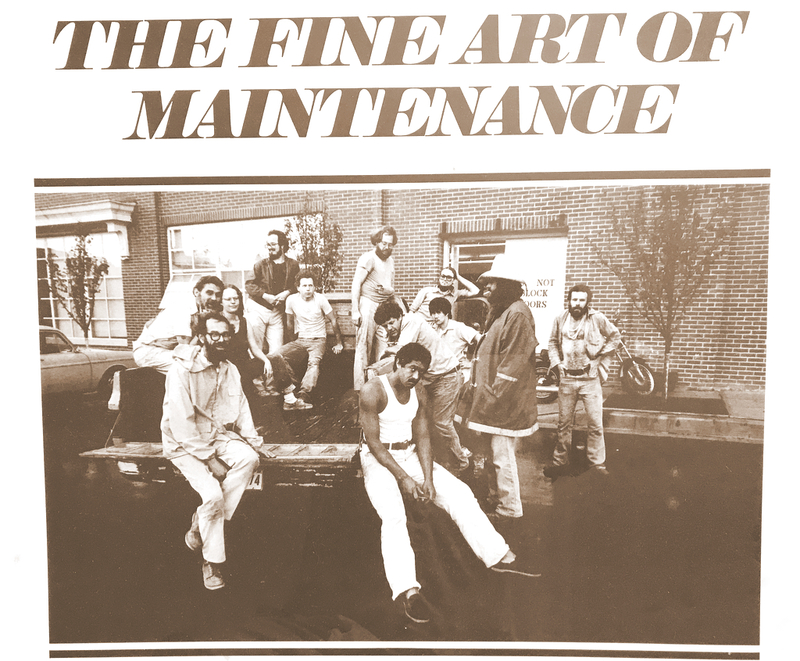 Dilts is at the lower left of the poster announcing the July 1981 art show of the Maryland Institute maintenance crew. Also in the picture: sculptor Kevin Donnelly, collagist Monica Broere, painters Thomas Jenkins and Suthat Pinruethai, sculptor Roy Sprengelmeyer, mixed media artist Robert Alholm and sculptor John Ferguson. 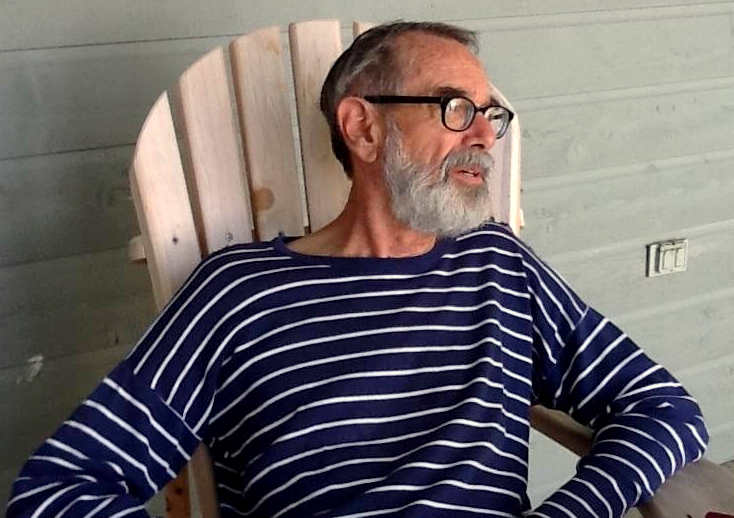 Jim’s enthusiasm for Baltimore’s unique built environment, filled with survivors of 19th century fads and industrial functionality, led to several projects and books. They included Baltimore’s Cast-Iron Buildings, coauthored with Catherine F. Black, and A Guide to Baltimore Architecture, co-written with Sun art critic John Dorsey and including a preface by novelist John Dos Passos. The latter book offered comprehensive walking and driving tours of Baltimore and surrounding counties. Its popularity was attested to by its multiple editions. Combining architecture with his enduring love of music, Jim reinvented himself in the late 1990s as an impresario. Along with artist and boat builder Ray Wise, he brought national jazz acts to places like the Romanesque oval sanctuary of Lovely Lane Church. “Jazz in Cool Places” enriched audience ears for a number of years, while keeping its promoters scrambling to pay the bills. He was in his 70s when he undertook the challenge of trying to restore and reopen The Peale, the oldest museum building in the country. Located on Holliday Street north of City Hall, the Peale served as the first home of Baltimore government. For decades, it tottered on the brink of abandonment and demolition before it was converted to a municipal museum. Bad times struck the Peale again in the 1990s when it was closed and its records were moved to the Maryland Historical Society. The non-profit group that Dilts helped form raised funds and lobbied the city to re-purpose the building into a center for Baltimore history, folklore and architecture. Raising more than $2.5 million in private funds, the building is set to reopen in 2020. At the time of his death, Jim was the Peale Center’s president and guiding light. He is survived by his wife of 31 years, Dr. Penny Williamson; two adult children, Cara Suzannah Latil and Jordan Dilts, both of Santa Fe, NM; and a stepdaughter, Jessica Hanna, of Kansas City. Jim’s latest book, The World the Trains Made, will be published this September (2018) by University Press of New England. It is the first ever comprehensive survey of the structures built in North America for railroads during their heyday, from high-rise office buildings and beautiful resort hotels to lowly roundhouses and shops. Jim was also a devoted reader and contributor to The Brew. We especially enjoyed this 2012 piece, Buildings, like books, tell a city’s story.